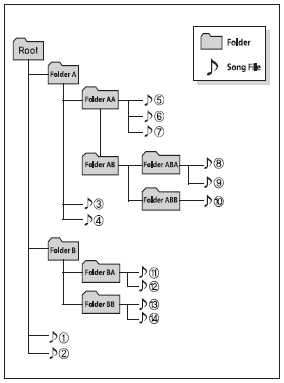 Depending on the type of CD-R/CDRW CDs, certain CDs may not operate normally according to manufacturing companies or making and recording methods. In such circumstances, continued use may cause malfunctions to your audio system. The System may not play inauthentic MP3 or WMA files. Playing videos through the USB is not supported. • Use of USB accessories such as rechargers or heaters using USB I/F may lower performance or cause trouble. Some non-standard USB devices (METAL COVER TYPE USB) can be unrecognizable. Please avoid using USB memory products which can be used as key chains or cellular phone accessories as they could cause damage to the USB jack. Please make certain only to use plug type connector products as shown below. Some iPod models may not support communication protocol and files may not properly play. Some iPod devices, such as the iPhone, can be connected through the Bluetooth®Wireless Technology interface. The device must have audio Bluetooth®Wireless Technology capability (such as for stereo headphone Bluetooth® Wireless Technology). The device can play, but it will not be controlled by the audio system.